Baseball may be a game full of statistics, but what Bob Barrows gave to the game – and what he accomplished as a coach – arguably defies measurement. For the better part of 65 years, baseball was a yearly ritual in Bob’s life and it seemed his enthusiasm for the game grew in direct proportion to the number of years spent in it. As a young teen, Bob was a member of seven American Legion, AAABA, and MUNY championship baseball teams of the 1950s. During his four years at Canisius College, the third baseman averaged .385, with a .500 batting average his junior year. Two of the people that influenced his decision to enter coaching were Bob McKinnon, whom Barrows played for at Canisius College, and Mel Palano, who gave him his first coaching assignment at Timon High School. 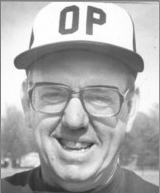 From 1955 to 1960, Bob coached the Timon junior varsity baseball team, compiling a record of 40 wins, 4 losses during that time. He went to Orchard Park High School in 1960, taking over the varsity program a year later. For the next 39 years, Bob Barrows would become a baseball institution, setting records and influencing young men like no other local coach before or since. His record includes 24 ECIC division titles, seven Section VI titles, and a state championship in 1988. His 643 career wins places him second on the state’s all-time victory list. He was New York State coach of the year in 1993 (and again in 1999), and was runner-up in a national coach of the year voting. While justifiably proud of his accomplishments, Bob would be first at bat to tell you that he didn’t do it alone. He credits McKinnon, Palano, his assistants, and all the boys that played for him. What is so special about Bob Barrows is that he never lost sight of the kids; whether they were all-stars or the last on the bench, he was always there for them. He produced several great collegiate and major league players – among them Frank Cipriani and Dave Hollins ? but what gave him equal satisfaction was watching less-talented players overachieve. His success on the diamond earned numerous accolades, awards, and recognition including election to the Western New York Baseball Hall of Fame in 1998. Earlier this year, he was inducted into the Timon Hall of Fame and the Orchard Park Hall of Fame. Though it will never be found in the box scores, the interest he maintained in his players is what made Bob Barrows the winningest coach, and one of the most beloved, in Western New York history.